2018 - Triumph Street Triple RS - Short Review! I recently had the opportunity to test ride the new 2018 Triumph Street Triple RS motorcycle. I have compiled a short review with my thoughts on the positives and negatives relating to the motorcycle. I have road tested a few motorcycles over the last couple of years in an attempt to seek out the ideal bike for urban and country road blasts and possibly some track days. I wanted a sports motorcycle with droop handlebars but even after 6 months of exhaustive neck and back exercise, I found that the current raft of 'full on' sports bikes, had too much of a lean forward angle for my age. My back and lower spine were fine but it was my neck and jaw muscles that suffered. As Clint Eastwood said in the movie Dirty Harry - Magnum Force, "A man's got to know his limitations". I also decided that a bike which weighed sub 200Kg WET might be a better option for me as I entered my 70s but it would have to deliver enough power and torque to make it interesting. I also wanted character but there are few motorcycles these days that ooze character. The RS is a very nice looking motorcycle, more so in the flesh. The TFT colour screen was one of the best dash fascias I have ever seen on a bike. It can be configured to several different types of display and it was very clear. I have a 33" inside leg and yet the seat height was enough for me to ride the bike without any movement restrictions or cramping and there was plenty of room between the seat and the pegs. I did not feel uncomfortable reaching the bars, they were slightly forward but with my long arms I was seated in a semi-upright position without any wrist strain. I test rode the silver one on a warm, sunny, dry day and it was fitted with an Arrow Slip-on exhaust - the note was beautiful. The RS is quick to rev above 7,000 rpm and as you accelerate, the quickshifter gear changes are slick, short and the revs are kept around that mark or higher - accompanied by the glorious roar of the exhaust. Peak torque is reputed to kick in at 10,800rpm but I experienced plenty of torque at 7,000rpm. I left the bike in ROAD mode for the test ride and the power delivery was awesome. I had no complaints about the low down torque. On a back road, I remained in 6th gear, dropped the speed to 35 miles per hour and when the throttle was opened up, the engine picked up the revs and the speed, without any hesitation or engine complaint. As a rule of thumb for 'smooth' normal riding in an urban heavy traffic environment, I found that my mph speed was best suited, for instant and accessible power, to the gear number - (20mph = 2nd gear) - (30mph = 3rd gear) - (40 mph = 4th gear). The brakes are overkill and take some getting used to, although the brake lever can be adjusted (I did not attempt to adjust it). The front brake is deadly and I had to learn to pull the brake lever more gently when slowing down behind slow moving traffic coming up to traffic lights at red. On a clear road at 70 mph, the brakes are incredible at pulling the RS up in an test emergency stop. I don't know if it has dual braking on the front brake lever but I used both brakes to ensure her rear wheel stayed on the road and I never felt the ABS kick in on my braking tests. I would fit the sides of the tank with Techspec SS Snakeskins to enable a better grip with my knees to ease the brake strain on my wrists and for better handling. The bike's lightweight matched with Pirelli Diablo Supercorsa SP tyres, 'ride by wire' technology and the power/torque delivery, guaranteed that the RS is a dream to handle (default front/rear suspension setup) in ROAD mode and sticks to the road like glue. I pretty much thrashed the bike around some country corners but I never felt the traction control come on and impede the power. The RS has incredible acceleration when you keep the revs high in the gear shifts and I often found myself hanging on as it rocketed forward. The power/delivery is overkill for country roads but I reckon on the track in TRACK mode, this bike would hammer even 200BHP 'super sport' bikes on the corners but not on the straights. For urban, country roads and motorways, the RS is way more than enough and a blast for thrills and pure enjoyment. I test rode the RS on the Edinburgh City Bypass which is notorious for heavy winds, especially cross winds. I expected the RS to be buffeted around a bit but I was pleasantly surprised, when on the odd occasion, and for safety's sake, I had to briefly accelerate to 80mph, the bike remained very steady. The front wind blast was also not a problem at that speed but to ease having to hang onto the bars, due to the wind force on my chest whilst under acceleration, I would fit the optional Triumph small tinted windscreen to the RS. The mirrors were excellent with a clear view behind but suffered from blurring at higher speeds. It was strange because I did not feel any vibration in the bars. There are a few negatives that I experienced in ROAD mode. The obvious one is when you move away from the lights - the clutch lever is almost out and the throttle is less than instant. I had to give it plenty of revs and slipped the clutch to guarantee a smooth takeoff. If I failed to do this, the bike would stutter or stall. Its not a big problem because by the end of the road test, I was getting used to dealing with this issue. Lane splitting and urban clutch/brake/throttle very slow manoeuvres were not a problem, although the turning lock/circle was not brilliant. I understand that in SPORT mode, the throttle is sharpened up with less initial lag. I notice on the Triumph website main photos there seems to be an option for an adjustable clutch lever, but not in the accessories configuration - I will explore this on a return visit to the dealer. Apparently (from watching other reviews) the stock clutch lever can be adjusted - so that is good news. The standard controls of the RS are where you would expect them but the left side is a bit cluttered around the indicator and horn switches with the addition of the mode switch and the toggle selection switch for the dash menu. The indicator switch was less than tactile and I was always looking down at the switch to make sure I had hit the correct one and checking the dash to make sure the indicator was on. Invariably when I applied the switch, there was a 1 in 5 chance it did not engage the indicator, especially when operating the left one. I was wearing winter gloves but I did not have this problem on my own motorcycle. I think there is a knack to the indicator switch on the RS and I am sure the problem can be rectified with practise. The mirrors blurred out in the higher rev and higher speed range, even in 6th gear. Numb bum pain crept in after about 30 miles riding the RS. It subsided on the country corners but as soon as I was on the dual carriageways or the motorway, it came back. There is no doubt that the narrower front of the seat is better suited for the track and there is not a Triumph option of a 'comfort' seat. Perhaps it may not be a problem for a younger guy but I was still suffering after the test ride and for several hours. Its a pity because there was no jarring of the spine and the RS suspension soaked up the rough roads but nevertheless (for me) I would have to search for a 3rd party comfort seat or re-pad/recover the existing stock seat with a gel pad inset. The RS is not alone in this problem as BMW and Yamaha, both offer 'comfort' seats for their sports roadster models, the BMW S1000R, the Yamaha MT09, MT09 SP, MT10 and MT10 SP. Another option for the RS is to soften the rear suspension, however pre-load has to be adjusted by the dealer workshop and from the Rear Chart below, the default compression is fully out at a comfort maximum setting of 20 and the default rebound shows an allowance of 6 clicks to take it from 14 to 20. Technically, the default front/rear suspension settings have to be manually changed to suit the motorcycles electronic mode in use. Perhaps a better option (for me) is to slip on a pair of 'gel padded' shorts (used for my pedal cycle) under my textile trousers or my Kevlar padded jeans - will try them out on my next test ride. Please note that in both chart cases, front and rear are set up as ROAD (default) from the factory. RAIN and RIDER electronic modes are not referenced and COMFORT mode is not an electronic mode. 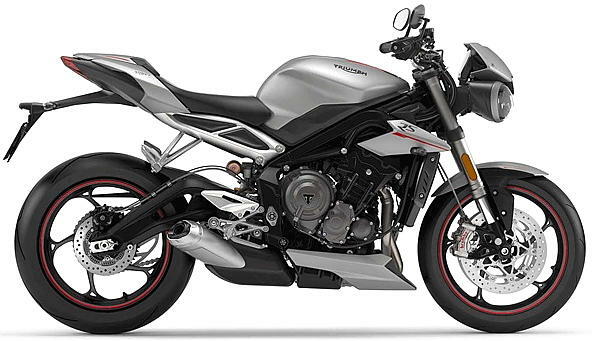 After test riding the 'Streets' sibling, the new 2018 Triumph Speed Triple RS, I ordered a black one and I expect delivery sometime in early May.